A mile and a half (two and a half kilometers) underwater, this alien-like, long-armed, and--strangest of all--"elbowed" Magnapinna squid is seen in a still from a video clip recently obtained by National Geographic News. 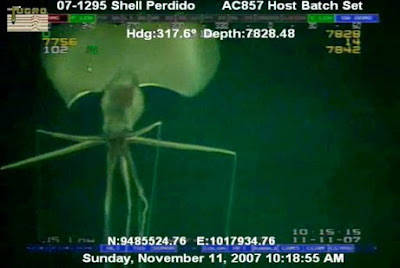 Filmed by a Shell oil company ROV (remotely operated vehicle) on November 11, 2007, the squid was at the Perdido oil- and gas-development site in the Gulf of Mexico. The video is evidence of how, as oil- and gas-industry ROVs dive deeper and stay down longer, they are yielding valuable footage of deep-sea animals.